Active Dunwoody chamber members save 10% off their orders when they mention this offer. Offer excludes shipping, direct mail postage and taxes. Cannot be combined with any other offer(s). Valid at Minuteman Press Sandy Springs only. Happy Hour Special - Come to Moondog Growlers between 4 pm - 6 pm, Monday - Friday with 2 or more co-workers (total of 3 people) mention this add and get 15% off your bill. Hope to see you soon. SharedSpace offers a professional coworking facility for those seeking a more inspiring and connected work environment. 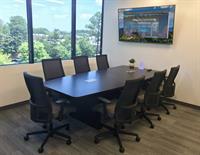 From open-plan desk usage to dedicated offices and conference room rentals, you'll enjoy all the professional amenities you require (fast internet, free printing, coffee, weekly happy hours and more! ), plus, a great community of fellow remote workers and entrepreneurs.